Often, one key per door can become stressful. With too many keys on your keychain, especially if you own a business, a master system is the practical way to go. In a master system certain keys are specified to certain vicinities with multiple locks, or just a certain set of keys the user has specified. These master keys are given to a select few that the customer specifies, they are usually given to a select few because they provide much access to many doors and locks. A simple master key system would involve multiple locks that were keyed both individually and separately. These keys are designed so that, although the master key will work everywhere, a key that was made only for one door will only open that door, and none of the others. Allowing workers of all types of authority to have access to the things they are authorized too, while the master keys will work for everything. 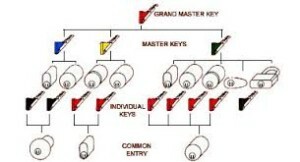 A more complex setup often referred to as a three tiered system, is where there is one key (or set of keys) that could open all the doors, another that could open a select set of doors, such as a certain building, and then individual keys to open the doors individually as well. This type of system if very effective in the business world because there are many different levels of authority throughout big businesses, and different employees are given different privileges, this system allows a simple and convenient way to distribute privileges among employees while keeping the maximum authority among the rightful persons. Distributing privileges among a big business is a very important and key task in organizing authorities and access to certain locations and vicinities, leave it to a locksmith to get the job done right.